A quick perusal of HeadFi's on-line chatroom reveals two brand names which non-headphone aficionados might not recognize as the household names they appear to be on this forum: Mikhail's SinglePower products and Ray's Emmeline series. Both makers employ tubes in their offerings and enjoy a strong following among the cognoscenti. I decided to get into the act and broaden my own headphone-related horizons. The first entrant into these races is Ray Samuel's new SR-71. His top-line tube Stealth has arrived as well. Ditto for Mikhail's MPX3 which will be followed by his own very best effort. Today's micro contender is a twin 9V cell-driven portable headphone amp sized like a cigarette pack. It's housed in a rounded-edge black aluminum extrusion. A black face plate bolts to one end, a rear cover removable via two small thumb screws to the other to access the battery compartment. The absence of RCA terminations and the use instead of 1/8" jacks for i/o ports loudly signals the intended usage. The SR-71 is a companion driver for portable Walkman/Rio-type devices plus computer sound cards. Not owning the necessary adaptors to patch the SR-71 into my main rig didn't seem critical then. My wife's laptop to the rescue which had already served me well to put HeadRoom's USB-fitted Total BitHead through its paces. In fact, the similar focus of both amps made them natural comparators. That's how I'd conduct the review for which I'd received an optional 1/8"-to-1/8" EarCandy cable tail from The Cable Pro. It was terminated in right-angle 3.5mm stereo mini plugs on both ends. 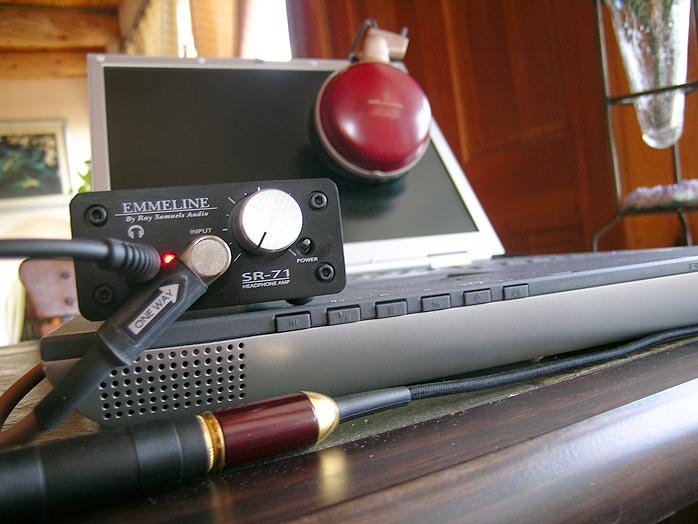 The 1/8"-to1/4" adaptor included with my Sennheiser HD-650s would connect my two cans to Emmeline's pert li'l box. Removing the back cover, batteries and volume knob allowed sliding out the motherboard along two wall rails of the extrusion. Cleanly laid out in a dual-mono op-amp configuration with quality parts, I'll deliberately avoid divulging details to protect the designer from copy cats. Blatant rip-offs, I've been told, seem to be operating procedure among certain on-line elements of this headphone world. While anyone can certainly indulge reverse-engineered DIY efforts by purchasing a unit, let them at least do that rather than copying circuitry pro bono from our site. Well made, well labeled (including a phone number and website URL on the battery cover), with a tight-action pot and cleanly actuated miniature power switch, one can't fail to consider this piece cute to the extreme. Its top cover silk screen reads "dual mono high resolution headphone amp". Time to put that claim to the test. When thinking about how to visually relate the actual size of puny SR-71 against a common object, I discovered that the extrusion's length sans front and back panel is precisely the length of a business card. That just asked for some gratuitous self promotion (as though you didn't know what site you were on). Hearing specific sonic attributes is one thing, ascribing them to particular design choices quite another. I was curious how the 1/8" jack versus USB interface of the Total BitHead would compare now that I had a quality 3.5mm cable interface to make that comparison. USB is said to not just be lo but no-jitter and Wavelength Audio's Gordon Rankin has even built a HighEnd USB-driven DAC for that reason. Audiophiles are discovering that computer hard drives make for excellent 'transports', especially when you use something like Exact Audio Copy to import the music files. The VRS Reference System mightily impressed our own Jules Coleman whose tastes in CD playback are shaped by the $14,000 Reimyo player. He couldn't conceive that a hard-disk based 'computer audio' approach even stood a chance and was shocked to learn that this juxtaposition turned into a round of equals among equals. No jitter, no laser assembly, just magnetic storage - don't pooh-pooh hard drives just because they reside on a computer. 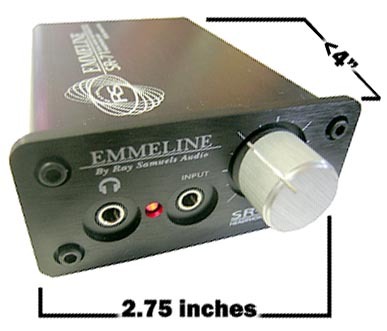 How would Emmeline's traditional S/PDIF interface compare? I'm about to tell you but remember - there's no way of knowing how much of what I heard was due to the different amp topologies and parts selection between the HeadRoom and Ray Samuels units, and how much was due to the different cable interfaces. What I can tell you now is that when comparing apples to apples -- S/PDIF vs. USB on the same HeadRoom amplifier -- the USB feed was slightly superior, this most noticeable with leading edge clarity and 3D soundstaging cues. Considering that the USB cable was a 'throwaway' plastic jobbie and the S/PDIF link a high-quality audiophile-approved affair, this was a bit surprising but confirmed that the USB interface could be a very worthwhile avenue to pursue for HighEnd manufacturers of digital products. But back to the actual product under review, the Emmeline SR-71. Compared to the USB-fed Total BitHead, the SR-71 was drier especially in the bass where it exerted more control for sharper outlines and better damping, attributes that were very welcome on Bobi Cespedes' phenomenal Rezos [six degrees 657036 1076-2], a Yoruba/Cuban crossover with massive bass beats compliments of an Oakland-based club master. Having just received the SinglePower MPX3 6SN7-based triode headphone amp as well, it was fascinating to note how different amps strongly affect the peculiar 'soundstaging' that's to be had with conventional 'cupped' headphones. The MPX3 doesn't take the soundstage so much out of the head as it moves it backwards towards the occipital while clearly expanding it laterally and simultaneously sublimating the hard-panned effects that often lock performers squarely inside your grey matter. Rather than poor localization, the MPX3 creates a lot of inter-performer space that doesn't alter placement but also resolves the surrounding environment they're inhabiting to make the whole presentation more organic - less focused on just the sounds but balancing them against tangible silence/space. The SR-71 and BitHead are more 'concrete' by comparison - more lock, less float, more foreground, less background. Curiously, it's not really a matter of more or less data captured but rather a shift of relative emphasis. It's not a quantitative matter of hearing more with the tube amp and less with the transistor units. It's a qualitative matter of different gestalt and thus not better/worse but simply different to appeal to different listeners. The SR-71 captured Julius Melendez' searing Cuban trumpet in all its glory without injecting the kind of glare that's often synonymous with sock'em brass blown at high pressure in the piercing upper register. A definitive strength of Ray Samuels' sonic Schnapps flatman -- reminiscent of those shallow shirt pocket containers I've seen Austrians use for a quick private swig of potent Calvados or Jägermeister -- is the bass tautness and extension it achieves. This particular album is erected on a shifty foundation of very substantial bass and when reproduced properly and thus anchored rather than drifting, transports you to a modern Candoblé ceremony where the priestess leads the congregation over the beats of the bata drums while the dancers are being ridden by the Voodoun deities. Besides the lack of free-field staging, headphone bass is likely the other dividing line that keeps certain listeners outside the headphone church. Though they might have to agree that good headphone bass is often vastly superior to speaker in-room bass when it comes to precision and articulation, they'd be right countering that it just doesn't possess the whole-body slam factor, impact and scale you can get from a regular speaker system. When a headphone amp like this one thus excels in moving the headphone experience closer to the speaker experience because the bass register is weighty, full and solid as the proverbial monster rock, it softens the in-the-head misery many critics of the headphone experience tend to complain of. Returning to the BitHead from the SR-71, the bass got a little softer, warmer and cushier, not dissimilar from good low-power triodes. This particular mien then spilled over into the midrange as well, feeling a little less articulate and precise. Shuttling back and forth between both amps showcased that the greater incisiveness of the SR-71 never crossed the line into etched or hyped territory at all. Its effect is perhaps best described as slightly better resolution coupled to a superior damping factor or more substantial power supply. Especially on Trance/Ambient/New-Age/Whatever albums like Hector Zazou's Songs from the Cold Sea [Sony, 1995] which mixes synthesized and acoustic instruments with their respective attacks and decays, this heightened resolution made it relatively easy to traverse the layered soundscapes and distinguish between real and virtual instruments. There was as much visibility in the center of the stage as in its lateral corners for a strong sensation of 'no preference' equality regardless of positioning. Everything was equally acute and present. According to Dr. Jim Langham, Oakland's WorldMusic maestro, Lynni Treekrem's Haugtussa is the best album of its kind - Norwegian female vocals in ECM/Lisa Gerrard-type settings, a genre Dr. Jim's intimately familiar with. He just sent me a copy and once again, he's right - this is a superlative album right up there with Kari Bremnes' best. With a delivery hovering between soulful folksy balladeer and neo-tribal Shaman, Lynni's voice invites daydreaming. The listener can easily slip into it and be carried away. Noticing every little inflection, every little shift in harmonic distribution which sometimes is like dither above or below the fundamental proved how the "high resolution" moniker of the little Emmeline's silk screen seems pretty factual. The uppermost treble appeared very subtly shelved to prevent fatigue which is far more important in my book than ultrasonic record-breaking that can quickly wilt your ears. Incidentally, the gain taper of the attenuator is wisely shallow to make for a wide range of smooth adjustments before reaching your chosen final level. On the 40-ohm/100dB W-1000s, this equated to a 1:00 o'clock setting while the Sennheiser 650s wanted 3:00 o'clock. As I've noted before when mentioned these phones in the same breath, I prefer the audio-technicas regardless of what amp has come through yet. With the Emmeline, the Sennheiser again sounded more distant, less present, less full, less bursting with color. The word that came to mind was relatively tame - British politeness. As popular as the Sennheisers are -- they always come up as "best dynamic headphones" in pretty much any discussion that doesn't stray from the affordable <$1,000 sector -- it's a shame that the ATH-W1000s don't enjoy more visibility. They're clearly in at least the same league and many listener might agree with me that they're indeed better. Let's call them the sleeper phones then - deep-cover foreign agents that live a normal invisible life far removed from publicity or any acclaim until the secret handshake activates their broadscale mission to generates big headlines and Jason Bourne-style action. Back to the Emmeline amp. As the photo shows, it's a tiny box but a natty dresser who eschews plastic parts like the plague. This gent strikes me as the ideal on-the-go travel companion for the very serious listener. And considering the quality of construction and sonic performance, the asking price seems right on the money. It's been a while that I've looked into HeadRoom's catalogue to know which of their models competes head-to-head with Ray Samuels' Emmeline SR-71. But this newest entry is clearly very stiff competition to become a must-audition in the $400 headphone amplifier races. As good as the Total BitHead is, the SR-71 is better yet. Seeing that it's more expensive, that's no reflection on the Head. And though it probably shouldn't matter, the all-metal versus all-plastic construction earns the Emmeline additional brownie points with our common audiophile preferences for substance and heft. As our reviews of the chip-based 47Lab and Audio Zone integrateds have shown, there's something about that architecture which doesn't sound typical solid-statesmen-like at all. 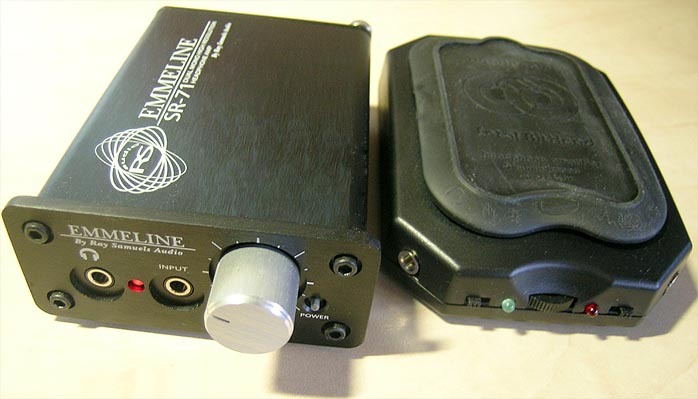 The op-amps of the Emmeline -- liberated as they are from having to drive anything other than headphones -- evoke memories of those speaker-based amplifiers; namely a combination of precise transient attack, tight PRAT, excellent image density and just a whiff of midrange wetness. Add very good LF control, zero noise, perfectly slow-ramping gain structure to accomodate super-high-efficiency in-the-ear bud designs and this little box could just be the new champ to beat in its league. Using the high-resolution Meridian 508.24 as a source during R&D and final circuit tweaking clearly paid dividends for this mighty mouse. Next up from Ray Samuels Audio? 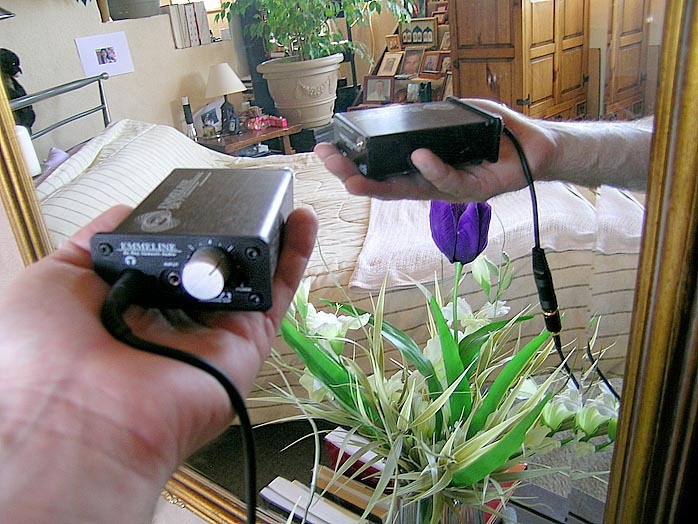 A review of their top-of-the-line two-box tube Stealth preamp/headphone amp. Choices for headphone lovers seem to be at an all-time high. Dig in and come back for seconds, ya hear?